DSSSB Grade IV Exam Date – Delhi DASS Admit Card for Post Code 60/15: Are you looking for DSSSB Grade IV (DASs) Tier-I Exam Dates? When DSSSB Grade IV Exam will be held? The only question applicants had in their mind who applied for Delhi DASS Grade 4 Exam (Post code 60/15) long ago in 2013. Since then, Candidates are waiting for exam dates for DSSSB Grade IV examination for various Group D posts. This is really huge gap between any Recruitment Notification and its Exam dates. DSSSB DASS Grade-IV Exam date announced which has scheduled to be held on 10.09.2017. Finally a good news from DSSSB, They are finally ready to conduct DASS Grade IV exam on date, which was announced 4 years ago. Now, DSSSB Grade IV (Post Code 60/15) DASS Tier-I exam will be held on 10th September 2017. The Delhi Subordinate Services Selection Board (DSSSB) has finally come with new exam dates for DASS Grade IV exam date for post code 60/15. This is why they DSSSB are known for. The Selection Board has new date for Grade IV examination. As we all know, DSSC is going to held written examination for post code 60/15 in Delhi state. Note: The Delhi Subordinate Services Selection Board (DSSSB) has announced written examination date for DASS Grade II which will be held on 10-09-2017. More than three year has been passed since DSSSB issued notification of DASS Grade IV recruitment (Post Code 60/15) in 2013. A large number of candidates have applied for Delhi DSSSB Grade IV September/ October 2013 for filling up 400 plus vacancies. All those aspirants who had applied for DSSSB Grade IV posts are all set to sit in the Delhi DASS preliminary written examination on 25th June June of this year. DSSSB Grade 4 written exam is going to be held on 10 September 2017 after more than three year of Notification. All those candidates who are going to appear for Delhi DSSSB exam must know When DASS Grade IV (PT) exam will be held? What’s exam date of Delhi DASS 60/15 Exam? Finally, Bihar Staff Selection Commission (DSSSB) responded and scheduled its 1st Inter Level Combined Competitive examination date. According to the source from Delhi Subordinate Services Selection Board (DSSSB), DASS Grade (Post code 40/13) Written Exam will be held on 10 September 2017. Due to the several reasons including Delhi Government Elections, Government change Demonetization, Case on various other DSSSB examination etc, DSSSB Grade IV 40/13 exam date has been delaying for more than 3 years. Now they are ready to conduct the Delhi DASS Grade IV Prelim exam in the month of September 2017. Applicants are hereby informed that the DSSSB Grade IV Preliminary Examination 2013 will be held on 10 September 2017. 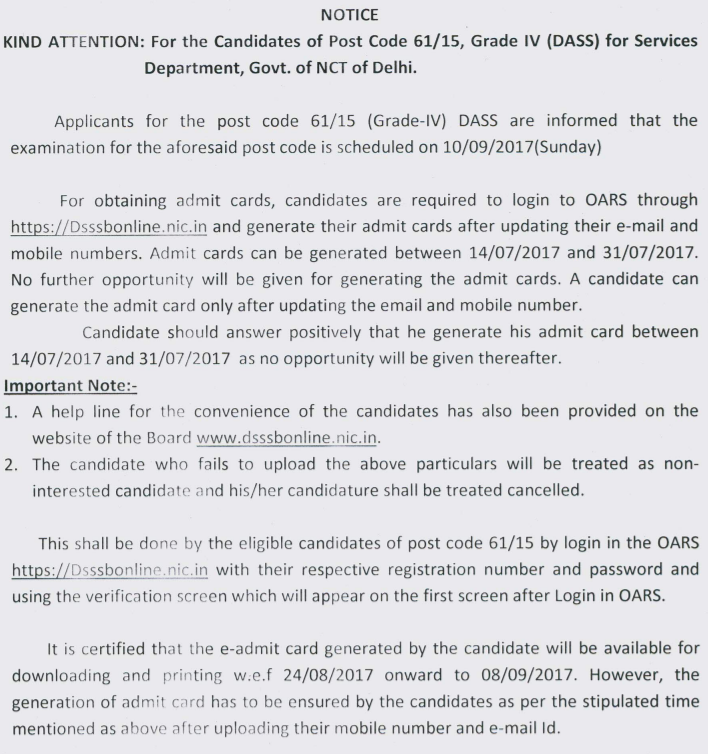 Candidates can download DSSSB DASS Grade IV Admit card after announced of Tentative DASS exam schedule. The exam date will be intimated in due course. Candidates are strongly advised not to wait for the written exam date, as it can be held any time on 10 September 2017. They must be ready for Delhi DSSSB Grade IV exam. Get in touch with us we will update this page as soon as we get any update from DSSSB.